WeRobotics was recently asked by the Center for Disease Control and Prevention (CDC) to organize a training on medical cargo drones in Papua New Guinea (PNG). The purpose of the training was to engage key stakeholders on the opportunities and challenges of using cargo drones in the wake of PNG’s most recent polio outbreak. An important component of the training was a hands-on demo of cargo drone deliveries. There were three key reasons for making this operational demo part of the training: 1) introduce stakeholders to cargo drone technology and standard operating procedures; 2) test how quickly a cargo drone team could be deployed; 3) test how quickly flight permissions could be secured from PNG’s Civil Aviation Safety Authority (CASA). WeRobotics was given 10 weeks to implement the project. It was completed in 8 weeks. WeRobotics partnered with two outstanding groups who ensured the project’s complete success: Soli Consultancy and Redwing Labs India. Soli Consultancy are the co-founders of PNG Flying Labs while Redwing Labs is a founding partner of India Flying Labs. Soli Consultancy has extensive experience in aviation regulations and took the lead on securing the flight permissions for the CDC project. They also took the lead on the logistics for the workshop. Redwing Labs is a cargo drone company from India that was recently selected Techstars USA, the biggest VC accelerator program in the world with an acceptance rate of less than 1%. Both Soli and Redwing went well above and beyond to ensure that the extremely tight timeline would be met. The CDC team in PNG lent invaluable support to both Soli and Redwing throughout the very busy 7 weeks leading up to the training and cargo drone flights. Around 40 stakeholders participated in the workshop, representing an important mix of expertise from public health, aviation, and private sectors. The workshop agenda is available here (PDF). The first session comprised talks from senior health officials from PNG, Mr. Berry Ropa and Dr. Mathias Bauri from the National Department of Health. Each speaker reported on the very real difficulties in reaching remote communities in PNG. They both noted that some communities can only be reached by helicopter (costing around USD 2,500 / hour). This was followed by an open discussion between participants reflecting on related challenges and potential ways that drones might be able to address or overcome some of these challenges. I had the pleasure of leading Session 2. The purpose of this session was to give all participants a solid background in medical cargo drones including use-cases, technologies, deployments, ethical issues, lessons learned and best practices. This 1.5 hour presentation was followed by an open discussion by all stakeholders. The session included a demo of cargo drone boxes by my good colleague Dr. Timothy Amukele and the first public announcement of the launch of PNG Flying Labs, which was very warmly welcomed by local stakeholders. Following the presentation, an open question and answer session allowed participants to move the conversations forward vis-à-vis the PNG context. Session three was a design-thinking session with a total of 5 breakout groups. Each group was asked to identify specific health projects that they believed could benefit from the use of drones. This meant identify the key health need, where geographically this need was greatest and which stakeholders would be best placed to implement the use of cargo drone deliveries in that context. Participants were then asked to select the one project they considered most compelling for immediate implementation. The results were particularly informative and some detailed enough to develop an initial concept note and proposal for. In the fourth session, I provided an overview of business models, cost structures, sustainability strategies, and different methodologies to assess the cost-benefit of introducing cargo drone deliveries in a given context. This 45-minute presentation was followed by another open discussion during which participants connected the ideas presented to the PNG context. The fifth and final session was run by Redwing and served as an introduction to drone regulations, safety, standard operating procedures, fail-safe mechanisms and more. The cargo drone demo day was scheduled for the day after the workshop at Pacific Adventist University. A backup day was set aside in case of rain. Sure enough, there where strong winds with heavy downpour that morning, so the demo day was rescheduled to the following day. Drones can certainly be made more weather proof, this is not a major technical challenge. The question has more to do with cost, since technical modifications and add-on’s necessarily require engineering resources. That said, as one local public health expert at the workshop noted, when there’s a heavy downpour like this in PNG, even 4WD cars will get stuck in muddy roads. The original plan for the cargo drone demo was to fly from the university to Sogeri National High School through a remote mountainous terrain 17 kilometers away and with an elevation difference of some 1,000 feet. While Redwing complied with regulatory requirements for flight approvals, CASA did not approve flights Beyond Visual Line of Site (BVLOS). They informed us that an American cargo drone company had recently crashed their drone in PNG as part of a project with an international health organization. As such, CASA preferred that the Redwing flights all be conducted within Visual Line of Site, or VLOS. PNG Flying Labs and Soli Consultancy are now following-up with CASA to continue working towards an unmanned aircraft operator’s certificate. Given that only VLOS flights were permitted, it was decided that the drone would take off from the university, fly large loops within visual line of sight and cover a distance of 17 kilometers in order to simulate the original flight plan displayed above. Vaccine vials were placed in the cargo box along with multiple icepacks and a temperature data logger. The cargo box was then fastened to the cargo drone. The total weight carried was around 680 grams. The temperature going in was around 1.5C. The Redwing drone is a VTOL or hybrid drone, meaning that it takes off and lands vertically but then transitions to fly like plane. The advantage of hybrid drones is that they can take off and land in narrow places but still have the range of a fixed-wing drone when they transition to forward flight. The demonstration went flawlessly, with the drone covering 24 km in approximately 20 minutes. The cargo drone flew at an average speed of 75 km per hour and at an altitude of 120 meters. The temperature of the cargo was around 7.5C after landing even though there was very minimal insulation. While Redwing did both the takeoff and landings manually, they noted that both could be done autonomously as well regardless of the cargo weight. Sincerest thanks to the following organizations for their partnership and trust: CDC, Gates Foundation, Soli Consulting, Redwing Labs and CASA. We’re very pleased to have launched Papua New Guinea Flying Labs, which is part of the growing South Pacific Flying Labs network. PNG Flying Labs will be introduced more formally in coming weeks and we expect Vanuatu Flying Labs to join the South Pacific Network in the very near future. WeRobotics is also exploring a number of other medical cargo drone projects in Nepal, Democratic Republic of the Congo (DRC), Cameroon, Uganda and the Dominican Republic. We’ll be sure to share our lessons learned and best practices for those projects that do move forward. So stay tuned for more updates throughout 2019. In the meantime, learn how South Pacific Flying Labs is using cargo drones to help reduce Dengue fever in Fiji, and how Peru Flying Labs and Dominican Republic Flying Labs are using cargo drones for other public health use cases. Also, be sure to sign up for our upcoming online course on Medical Cargo Drones in Public Health. The dengue fever outbreak in Fiji in 2014 was one of the region’s largest known outbreaks of the mosquito-borne infection. Scientists studying the outbreak believe climate change was a contributing factor: more flooding results in more areas of standing water for longer periods—perfect breeding grounds for mosquitos. According to the World Health Organization’s Regional Office, the islands of the South Pacific are “some of the most vulnerable places on the planet to health effects of climate change.” Unfortunately, existing tools to control these mosquitoes such as insecticide spraying are not efficient and have failed to eliminate dengue as a public health concern. Worldwide, an estimated 390 million human dengue infections occur every year. This explains why ministries of health in the South Pacific expect larger outbreaks. In fact, Fiji experienced another outbreak of dengue fever this year, which once again prompted urgent calls for more effective and preventative solutions. One such solution may be the use of Wolbachia-treated mosquitos. Wolbachia is a naturally occurring bacteria that prevents mosquitos from transmitting diseases like Zika and dengue. This explains why our partners at the World Mosquito Program (WMP) and the Ministry of Health and Medical Services have been releasing Wolbachia-carrying mosquitos in Fiji. This is done be driving around a town or village with canisters of Wolbachia mosquitoes (W-mosquitoes for short). The driver pulls over by the side of the road every few minutes to release one canister at a time. Over time, Wolbachia becomes established in the local mosquito population. When most of the mosquito population have Wolbachia, local communities in Fiji should be at lower risk of getting dengue, Zika and chikungunya. Releasing Wolbachia mosquitos “by car” presents a number of challenges, however. First, during the rainy and cyclone seasons, many roads become unusable while pools of standing water breed more mosquitos. What’s more, mosquitos that are released by car may not be uniformly distributed over an area but rather constrained by the local road network. As such, a significant amount of work and time has to go into planning the best routes for cars given these fixed constraints. Lastly, not everyone lives next to a road and so are potentially excluded from public health interventions. This explains why WMP teamed up with WeRobotics earlier this year. WeRobotics engineers have been busy developing an aerial release mechanism that can be attached to a drone. Combining both the aerial and ground-based release of W-mosquitos is expected to be a lot more effective. The aerial release mechanism can store up to 160,000 W-mosquitos at 5 degrees Celsius and release 200 mosquitos at a time every 50 meters. This is enough to cover an area of four square kilometers. Aerial releases are much faster than ground releases (no traffic, stop lights, pedestrians, etc.) and, unlike cars, drones don’t burn fossil fuels. A drone can cover an area of 10km2 in a couple hours while mosquito releases by car over the same area would require several days. In addition, the use of drones provides far more homogeneous releases and better coverage. Another bonus: drone routes are much easier to plan than car routes. A fully operational prototype of the release mechanism is currently being piloted in the South Pacific after 5 months of local community engagement and awareness raising. 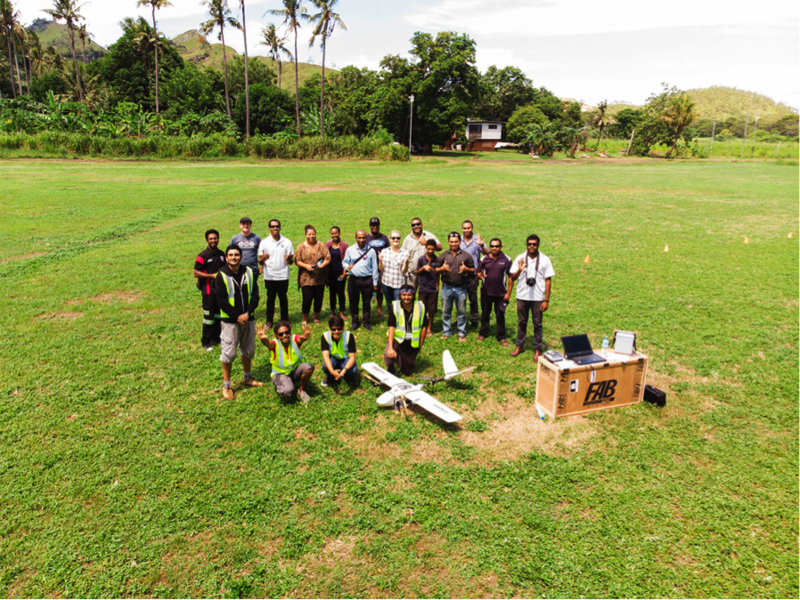 WeRobotics engineers have already trained local drone pilots with South Pacific Flying Labs and Drone Services Fiji on how to operate the drone and the release mechanism safely and effectively. 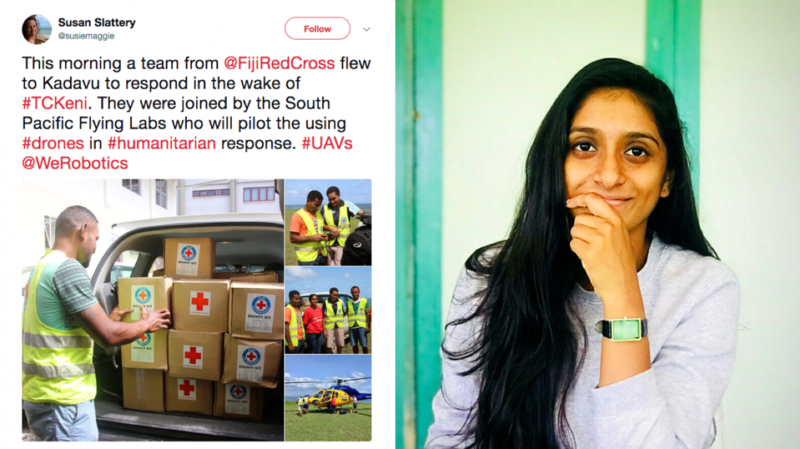 As such, the local team at Pacific Flying Labs is now taking the lead in piloting the drone and aerial releases as part WMP’s public health intervention in Fiji. Building local capacity is central to the mission of WeRobotics as is creating local ownership of health, humanitarian, development and environmental projects. The localization of this expertise and technology through the global Flying Labs network leads to more sustainable and impactful projects. When the pilot project completes this week, South Pacific Flying Labs and partners will have released around half-a-million W-mosquitos. WMP has engaged the help of local community members to host a large network of mosquito traps across the release area to determine how widely, quickly and uniformly these mosquitos have dispersed compared to ground-released mosquitos. W-mosquitos can be distinguished from others because the former have each been dusted with yellow-colored dye. Once our friends at WMP complete their evaluation following of trial, we’ll be able to quantify the added value of complementing ground-based releases with aerial releases. Future trials will seek to optimize the release methods so that mosquito deployments can be achieved across larger areas. South Pacific Flying Labs is funded by Australia’s Department of Foreign Affairs and Trade (DFAT). The drone component of the mosquito project is funded by the United States Agency for International Development (USAID) through the Combating Zika and Future Threats Grand Challenge. Earlier this year, WeRobotics tested the use of drones for mosquito release in Brazil using a completely different prototype release mechanism. We’re very pleased to announce the launch of the WeRobotics Online Training Institute. Training is absolutely central to the work and mission of WeRobotics. To date, we have provided our professional trainings exclusively in person. We’ve given these trainings to a numerous professionals across many organizations including the World Food Program (WFP), UN Development Program (UNDP), UNICEF, Catholic Relief Services (CRS), local universities and many national & local stakeholders including National Disaster Management Organizations (NDMOs) in Peru, Myanmar, Malawi, Mozambique, Nepal, Dominican Republic, Maldives, Fiji, Seychelles and beyond. We’re thrilled to be teaming up with our friends at TechChange to provide this training. Their highly dynamic online training platform is second-to-none. Just last year alone, TechChange trained over 7,000 people from 155 countries on their platform. We’ve been huge fans of TechChange and are grateful to finally have the opportunity to work both with their outstanding team and unique approach to online learning. While in-person trainings will absolutely remain central to our work and mission, we’ve realized that a substantial component of these trainings can just as well be provided online and scaled more easily this way. The reason for this is simple: technology is at most 10% of the solution in humanitarian emergencies and many other contexts including public health and environmental protection, for example. Technology is certainly an absolutely crucial 10% of the solution—serving as a multiplier effect—but without a strong understanding of the tasks necessary to use this technology safely, responsibly and effectively (the other 90%), you run the danger of multiplying nonsense and becoming part of the problem rather than the solution. As such we’ve decided to invest a considerable amount of time and energy to convert our offline trainings into online courses in order to train more people on how to use drones more responsibly across a range of sectors. Our very first online course will focus on Drones in Humanitarian Action: From Coordination to Deployments. The course will be identical to the trainings that we’ve provided to new and seasoned humanitarian professionals around the world. Drones in Humanitarian Action will give participants the training they need to be an important part of the solution during future disaster risk management efforts. The training is instrumental for anyone already engaged or expecting to support disaster response efforts. The course will be of equal interest to participants who want to better understand what it takes to lead humanitarian drone missions safely, responsibly and effectively. As such, the training is ideal for existing drone pilots including pilots working in the commercial drone space. That said, no background in disaster response or drones is required for this foundational course. 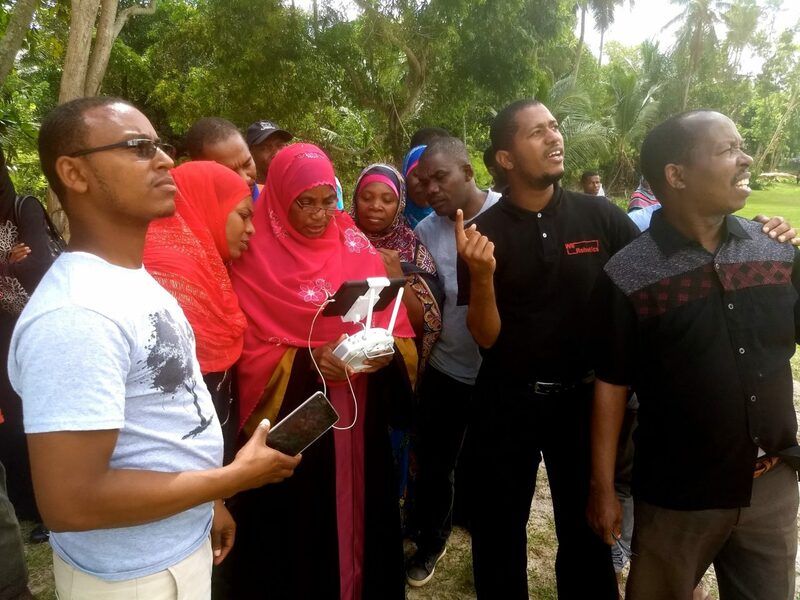 The WeRobotics training on Drones in Humanitarian Action are built on the first ever trainings on humanitarian drones provided by the Humanitarian UAV Network (UAViators) between 2015-2016. These professional trainings were given by WeRobotics co-founders Dr. Patrick Meier and Dr. Andrew Schroeder, and included trainees from the United Nations Office for the Coordination of Humanitarian Affairs (UN/OCHA), WFP, International Organization for Migration (IOM), Direct Relief,, NetHope, Medair, Global Medic, USAID, FEMA, AAAS, MIT, European Commission, ACF International, Greenpeace and many more. The online training on Drones in Humanitarian Action was prepared by the AidRobotics Team at WeRobotics. The team, Joel Kaiser, Dr. Patrick Meier and Dr. Andrew Schroeder, brings together over 40 years of experience in humanitarian aid and emergencies. Patrick will serve as primary lead for the Online Training. Dr. Patrick Meier: Over 15 years of experience in humanitarian technology. Spearheaded the coordination of drones in the aftermath of Category 5 Cyclone Pam in Vanuatu and the 8.0 Earthquake in Nepal. Co-directed the WeRobotics workshops on humanitarian drones for UNICEF in Malawi and for WFP in Peru, Myanmar and the DR. Coordinated and evaluated cargo drone field tests in Peru and the DR. Spearheaded the Open AI Challenge with the World Bank to use AI for the automated analysis of aerial imagery and previously directed applied research on related projects including a year-long study for the Red Cross on the use of drones for disaster risk management. Served as long-time consultant to the World Bank’s UAVs for Resilience Program. Founded the Humanitarian UAV Network (UAViators) and previously developed & provided hands-on professional trainings on humanitarian drone missions to a wide range of humanitarian professionals. Also co-authored the most comprehensive report on Drones in Humanitarian Action and played a key role developing the first humanitarian drone trainings and the International Humanitarian UAV Code of Conduct. Received advanced degrees in International Affairs from The Fletcher School of Law & Diplomacy and Columbia University’s School of International and Public Affairs. Authored the book, Digital Humanitarians, which has been praised by experts from the UN, Red Cross, World Bank, USAID, DfID, Harvard, MIT, Oxford and more. Dr. Andrew Schroeder: Over 10 years of experience in humanitarian and public health emergencies, logistics and disaster response, with extensive expertise in data-analytics, geospatial data and Geographic Information Systems (GIS). Internationally recognized leader in GIS, data science and applied epidemiology for humanitarian aid and global health. Directly engaged in relief efforts following numerous disasters including Cyclone Nargis (Myanmar), Haiti Earthquake, Japan Earthquake/Tsunami, Typhoon Haiyan (Philippines), Ebola Outbreak (Sierra Leone and Liberia), Nepal Earthquake, Hurricanes Matthew, Maria, Irma and Havey (Caribbean) and Wildfires (California). Founded the Nethope’s UAV Working Group. Co-directed the WeRobotics workshops on humanitarian drone for WFP and co-directed UNDP drones for disaster resilience project in the Maldives. On the core team of the Humanitarian UAV Network (UAViators) and previously provided hands-on professional trainings on humanitarian drone missions to a wide range of humanitarian professionals. Played a key role in developing of the International Humanitarian UAV Code of Conduct. Received advanced degrees in social analysis and public policy from New York University and the University of Michigan. When the registration for the course opens on May 1st, you’ll be the first to receive an invitation to register. Certificates of completion will be provided to participants who successfully pass the training. We plan to offer this training several times a year and already plan to introduce other trainings in the future including trainings on the use of Cargo Drones in Public Health and Drones in Environmental Action. In the meantime, big thanks to our friends at TechChange for their partnership.